On July 10th 2018, His Holiness Patriarch Mor Ignatius Aphrem II received at the Patriarchate in Bab Touma, His Excellency Mr. Achilles Zaluar, Ambassador of Brazil to Damascus, at the end of his diplomatic mission in Syria. His Excellency thanked His Holiness for his warm reception and recalled the good and steadfast ties between Brazil and the Syriac Orthodox Church. 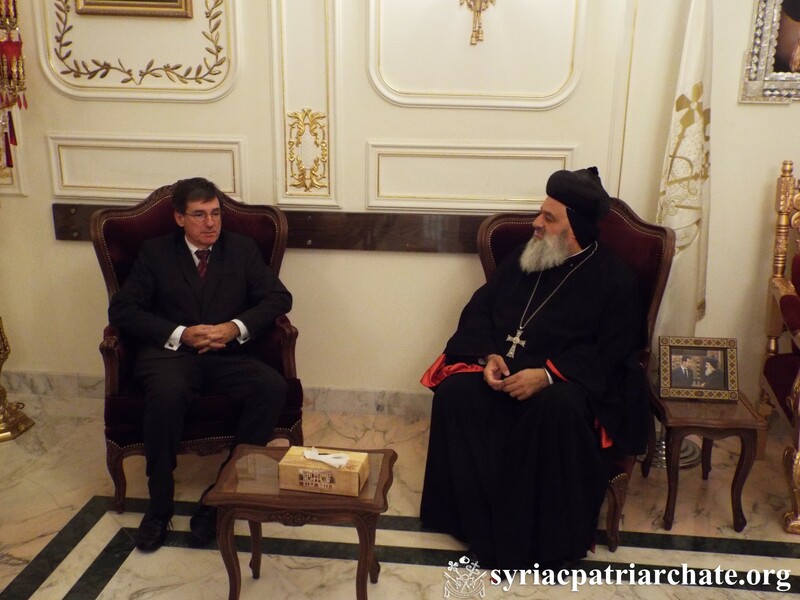 His Holiness Patriarch Aphrem II appreciated the important role of His Excellency in promoting peace in Syria. His Holiness also wished His Excellency all success in his new mission. His Eminence Mor Timotheos Matta Al-Khoury, Patriarchal Vicar in the Patriarchal Archdiocese of Damascus, and Very Rev. Raban Joseph Bali, Patriarchal Secretary and Media Office Director also attended the meeting. His Excellency was accompanied by Dr. Rafli Kardous.